På over 230 meter høye (70 meter) er den 1,300 år gamle Leshan Giant Buddha den største Buddha i verden og tiltrekker seg besøkende fra hele verden. Hold deg unna å gå seg vill i mengden av denne UNESCO-listede attraksjonen ved å besøke med komfort og bekvemmelighet av en privat tur, som inkluderer informativ kommentar, transport fra hotellet, og en sidetur til en lokal fiskerlandsby. Denne turen inkluderer også alle inngangsbillett, høyhastighets togbilletter og lunsj. The day didn't meet expectations. I know it was golden week and the whole of China was on the move. We left the hotel at 5.50am to get to see the Buddha . When we got there the queues were 4 hours long. I suggested a plan B. The guide was very sweet but spent a lot of time on her mobile or asleep in car or train. We then spent two hours at the train station on our return trip instead of looking at local things of interest. Lunch was very nice. So the day could have been better planned. Our guide, Terry, was really nice and knowledgeable. The lunch provided was good, too even though the food was very oily. However, the trip out there took FOREVER. It was 2.5 hours each way. Also, we had to pay 70 RMB extra each to see the entire Buddha. The line to climb down was INSANE, so we skipped it. As we were waiting in line for the boat to see the Buddha, we were told that the water was too law, and the only we we could see the Buddha was by speedboat. So that's what we did. It was kind of annoying because the boat took us out there, let us take pictures for 5 minutes, and then took us back. Only about 10 minutes total trip. Plus, this trip was VERY overpriced. Only do it if you have money to burn in your pocket. Flora was a tremendous guide, and this was a tremendous and very well organised day! Flora - who is very relaxed, chatty and full of interesting information - met us at our hotel, ahead of a short metro, and hour or so train ride to Leshan. From there we were met by a driver who took us to a local hot spot for some super-delicious food. Flora ordered perfectly, and was also kind enough to jot down a few other dishes and restaurants that she thought we might enjoy back in Chengdu. The Buddha is an jaw-dropping feat of design and engineering, Giant indeed, and we took the not very hard route down to its feet, and back up and though the UNESCO national park, all the time, happily nattering away. Travelling back, we could not help but notice the traffic jams from the train window, and were very pleased that we opted for this time saving, and scenic option. We highly recommend this day tour, and Flora as a guide. Great experience with our guide Heather, she is very knowledgeable and fluent in English. Leshan is quite the sight to behold, impressive structure and the confluence of the three rivers is astonishing. The caves with contemporary Buddhist carvings is also beautiful -not ancient, but still imposing and beautiful. Penny was a great tour guide. 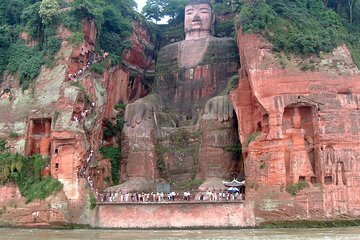 Very knowledgeable about the history of the Leshan Buddha! Punctual and communicated well in English! Had a great time with her as my tour guide! Fantastic tour! Our wonderful guide Cassie made it more like a day hanging out with a new friend (with excellent local knowledge) than like being on a tour. The Buddha is incredible, a must see. The food in the fishing village was so delicious and the view just gorgeous. Do this tour! It was very nice trip. Starting with High speed train which is convenience and comfortable for me and my mom. We had spend a whole day in Giant Buddha. The local delicious nice lunch was offered. Highly recommended for who have a short time visit in Chengdu. This is a great tour - but what made it truly memorable and special was my guide Penny! We had a blast - and she was able to give me lots of insight into the history of what we were seeing. She also knows all the ins and outs of navigating the sites. Fabulous day! But wear walking shoes and be prepared to walk and climb! I'm very fit and thoroughly enjoyed the physical aspect of the day, but if you aren't especially fit, you might find it a bit taxing. And ask for PENNY!!! This tour was excellent, very well organised and trouble free. Our guide, Jamie, was very energetic, very professional and knowledgeable, a lot of fun, spoke excellent English and she made our trip a fabulous experience. 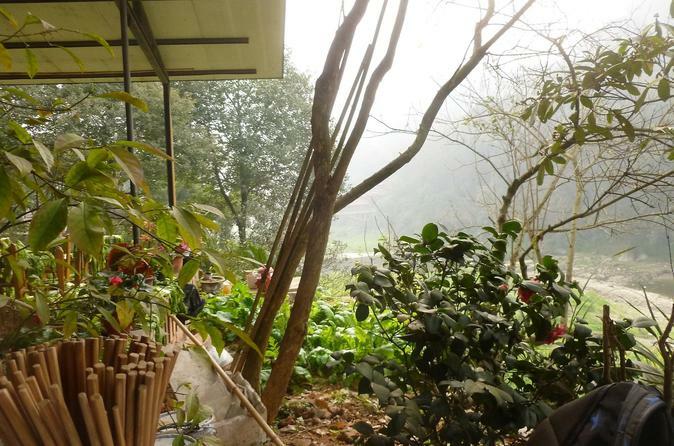 The bullet train ride to and from Leshan gave us an opportunity to see a lot of great countryside and experience a little of the Chinese way of life. The giant Buddha was amazing, both up close and from the river boat cruise and lunch at the local village was delicious. We even has some time to explore the local markets and stroll along the river. I would recommend the trip to all but don't forget to ask for Jamie.